Enemies of the People has been playing the festival circuit. It’s a documentary about the Pol Pot regime responsible for the “killing fields” in Cambodia. Now the movie is available on a 2-disc DVD set with 6 hours of extra features. This is not a standard documentary explaining what happened chronologically via talking-head historians. It’s a movie made by a citizen journalist — actually “citizen historian” is probably more accurate — whose family was killed Pol Pot. Thet Sambath isn’t a bitter man, but he is determined. He wants to ask “why” of anyone who participated in the killing. Over a period of years, Thet spent his weekends looking for members of the regime and their foot soldiers. He would befriend them — not on a pretense, but genuinely — and ask them to tell their story. I’m not surprised that these killers would want to talk. It must be very therapeutic to finally be asked to share your story, especially to someone as genuine and trustworthy as Thet. They understand that he is asking on behalf of history, and not to accuse. If I were a collaborator, I would want the chance to confess to someone like Thet. Thet’s biggest encounter is “Number Two Brother” Nuon Chea. (Pol Pot was “Number One Brother”). As the movie unfolds, Thet has managed to record interviews, but he hasn’t quite gotten Nuon Chea to open up, nor has Thet been able to admit that his own family was killed in the process. That final interview is what the movie leads up to. 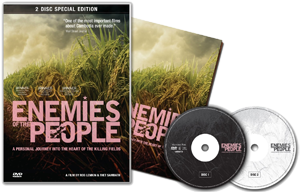 Enemies of the People is now available on home video, in a package with six hours of extra features. I was daunted by the sheer length of the extras. Having watched most of them, I am not sure they will be of interest to all audiences. Many of the features involve different people asking the same questions — about the movie, about the two directors (Thet and Englishman Rob Lemkin, who has strong ties to Asia), and about the historically important footage of Nuon Chea that Thet shot. But anyone with personal ties to Cambodia will find the movie and its deleted scenes a valuable historical artifact. Before diving into the extra features, open the booklet that comes with your DVD. In the back is a guide to which features are on which disc, how long they run, and a brief description of what they contain. The 26-page booklet also has essays by Thet Sambath and Rob Lemkin, along with an introductory essay by journalist Elizabeth Becker. The menu plays a long introductory scene — a full 30 seconds — before allowing you to interact. When I first put in the disc, I thought my player was malfunctioning because I didn’t think the menu was coming up. This became a minor annoyance when navigating or restarting the disc. Beyond the story of Po Chrey (another site of mass killings), this feature illustrates how good an interviewer Sambath is. He asks people for details: “were the bodies swollen?” “No, because I got there too the next day.” “Show me how they were tied.” Sambath’s style is the antithesis of courtroom cross-examinations. He rarely asks leading questions. They seem calculated to aid recall, without suggesting that Sambath is fishing for a certain answer. He’s a natural investigator. There are half a dozen deleted scenes on Disc 1, including one group of scenes called Nuon Chea Uncut. There is no Play All button, but they do play consecutively. The final deleted scene contains a warning: “Extreme content.” For a documentary about genocide, that seems like an odd warning. But it makes sense. When speaking about killing on a large scale, the violence is abstract. In the “extreme” outtake, one of the killer speaks about a specific victim and his own cruelty. It’s a fair warning. In this feature, Rob Lemkin talks about the project. He says he went to Cambodia when he heard the UN court was coming down on the Khmer Rouge. Thet Sambath was his local “fixer,” and soon he learned that Thet had beat him to the punch on making a documentary about the Khmer Rouge. They eventually decided to collaborate 50/50 on the project that became Enemies of the People. They knew they would be making a movie that would survive, digitally, far into the future, so they took care to protect and respect their subjects. Fifteen survivors in the United States met via videoconference with Sambath and 3 of the killers interviewed in the film. Their meeting ran 3 hours. Forty minutes of highlights are presented here. The victims wanted details. They wanted to know how the killers could have participated, how they live with themselves, whether they feel any regret. The killers were honest and frank. “We don’t want history to forget.” One says if he had the money, he would fly to America and let them chop him up if that’s what they wanted. Sambath, ever the gentle soul, ends the call by asking the victims how they can achieve peace. There is footage from many post-movie Q&A sessions. I skimmed these and found much of it repeating what was covered elsewhere on these discs. The audio and video quality is low on some of this footage, and there are no subtitles to help you out. These are clips of Enemies of the People in the news. Enemies of the People makes a splash at festivals, but sometimes the movie itself is newsworthy. In one, Thet Sambath says he will not hand over his tapes to the UN. The videoconference mentioned above also made the news. “Encounters of the Evil Kind” is a rap song inspired by the movie. The video includes footage from the film cut to the music. Maybe it’s not a great song, but it’s a nice tribute to the importance of the film. If you haven’t seen the movie, watch it first. If you want to dig deeper, open the back of the booklet and familiarize yourself with what’s available on these discs (read the essays while you’re there). Then jump to whatever piques your interest. You won’t be able to take it all in at once, so let your gut be your guide.